I love my interior design magazines. It is a thrill when I go through the mail and see what new magazine (or catalogs-love them too) has arrived for me to look through and absorb. Only one problem, as a recycler I always feel guilty that my magazines are adding to the environmental issues that many of us are concerned about. I read a magazine a few times, maybe tear out an article or two to save, and then add it to our recycling bin. That is the reason this trend towards online design magazines appeal to me. 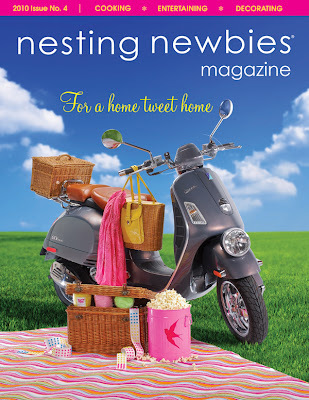 While every design magazine offers an online presence along with many cool online extras, Nesting Newbies is the first completely online interior design magazine that I am aware of. It made its debut in 2009 and has published four issues to date. Nesting Newbies makes downloading easy so you can download just a few pages of choice or the whole issue for saving or printing. 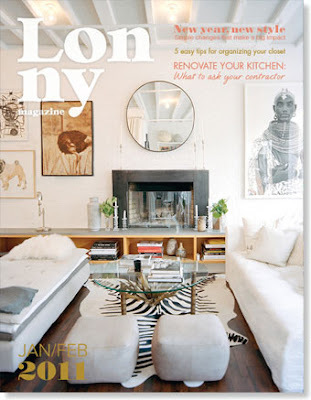 In October 2009 Lonny Magazine published their first magazine. Lonny Magazine has some gorgeous pictures and great articles and is published bi-monthly. Downloading is not an option, but you can save links and save pages as jpgs to print later. I was a bit disappointed to read on their website that they are going to start printing paper copies of issues soon including back issues. The latest addition is High Gloss. This lifestyle magazine is publishing February 1, 2011 and will feature articles on interior design, entertaining, fashion and travel. Founder and Editor in Chief is Paloma Contreras, creator of the style blog La Dolce Vita. I'm really looking forward to this magazine because it appears to have a talented team behind it. The best part? So far these online magazine are free! You gotta love that. Are there any good online magazines I should know about? Comment and let me know. and in May be sure to check out House of Fifty!